Americanism 8: Oprah's Big Give : Reform worship. 1. Poor, unfortunate people don't deserve a better life. All people, both poor and rich, deserve much worse, death. There is none good. Only Christ is good, and we inherit his righteousness through His death. 2. Getting more stuff doesn't make people happier. In most cases, in fact, it makes people more miserable. I wonder how miserable Oprah really is. For one thing, her riches have led her far from Jesus Christ. Only the treasure of Christ's body and blood can take away our misery and bring lasting joy. 3. Oprah gives for the sake of her own glory. 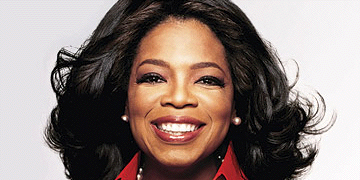 To Oprah, god is self, so doing things to exalt the self are most spiritually beneficial. It's like giving back to Christ for the sake of one's own financial increase, rather than for the work of His Kingdom. There is nothing sacrificial about it, just self-gain. So my friend. It is easy to point out the issues with someone else's theology in action (orthopraxy); but my question to you is: how has "americanism" infected your orthopraxy/worship (not theology of worship, your actual worship)? It's one thing to point out issues with Oprah, but how about doing the same to your own life style/approach. Keith, you know me and that I consistently point the finger at myself before anyone else, so it's kind of unfair and harsh to assume the opposite of me. As with all of the Americanisms on this blog, the purpose is to make the connection between prevalent beliefs and practices in our culture to our Christian worship belief and practice. Concerning Oprah, her influence permeates our culture, even deeply into the Christian sub-culture. Her self-centered message of good feelings and happiness counter the sacrificial and suffering-centered message of Christ. But it seems in this American culture of narcissism that many Christians are going right along with the wrong gospel, including myself in some areas of my life and worship. I know you're just stirring the pot and that you love me. Oh boy,... this is why I'm not a huge blogger. Two, I don't think I was harsh at all my friend. I didn't point a finger (I asked a clarifying question to hopefully make the post complete). I know that you are keenly aware of your own sin. You are one of the most humble people I know.... really, the spirit about your life is humbling to me in many ways. I simply stated that before we PUBLICLY correct someone else's orthodoxy/praxy, we should do the same with our own lives in a PUBLIC forum. I'm simply asking you to connect how your own worship (orthopraxy) has been influenced by the "prevalent beliefs and practices in our culture." Illustrate your proposition stated in this post with your life. Three, I guess based on ratings a lot of folks do follow Oprah, so correcting her theology in a public form has some merits... but I don't watch Oprah. I don't "hang" around Oprah. I can't touch Oprah. I hang around you. I watch you live your life. I can touch and break bread with you. So, I would rather (again, I'm more stirring here than anything else) hear how the "culture of narcissism that many Christians are going right along with the wrong gospel" influences "some areas of YOUR life and worship." I don't disagree with your proposition at all, I'm just wondering if you could illustrate it (man, I could write a book on how this junk has influenced my own orthopraxy). I guess I'm in the minority that has never watched Oprah, but I do watch you (and have been so challenged by you and your life). Again, Love you man! You ask me "to connect how your own worship (orthopraxy) has been influenced by the 'prevalent beliefs and practices in our culture.'" I would point you to my blog, www.reformworship.com. Okay, I'm just being a smarty. Truth is, in just about everything I think and do when it comes to worship theology and practice I have to make an intentional effort to "put away" the old worldly-influenced man, who thinks and lives according to the self-indulgent spirit of the culture, and put on the new Christ-permeated man, which is inherently anti-consumeristic. What this looks like corporately is structuring worship in an anti-consumerist, non-entertainment based way, encouraging worshipers to actively participate rather than get spoon-fed happiness. See my post "Getting Old" for the current layout of our service, which helps facilitate such worship. What it looks like personally, a much more difficult endeavor, is denying what my flesh craves, and accepting of what Christ offers, a life of cross-carrying sacrifice. I admit I have to speak more theoretically concerning my personal worship, as I sit here in my gorgeous suburban home on my wicked sick computer in my Banana Republic boxers, but what it should look like is undertaking everything I do as an act of worship: eating, driving, working, even sleeping. I'm going to begin a series on these personal acts of worship real soon. Amen, love being in the journey with you my friend!